Tom Graefe was a 20 year MCI / Sony Pro Audio veteran – Manager of Console Design, Co-Founder of Ft. Lauderdale's Musicians Exchange Music Complex & Soundshine Productions Recording Studios. Honestly there isn't enough room to list Tom's credentials, accolades, patents and clients. He's an Ol' School (Top of the Class that is) type of guy with incredible intelligence and incredible ears. His work literally changed the standards by which most, if not all, software based plugins emulating "Industry Standard Consoles" strive to capture. All great songs seem to have great producers and engineers behind them. But when the producers, engineers and others in the elite world of recording have questions... they call Tom. It's simple, Tom is, hands down, one of the most knowledgeable people on the planet when it comes to anything and everything audio. We won't go into his non-musical related studies, but lets just say, he could save the world. Thankfully, he has chosen to raise the bar in guitar amplification higher than it's ever been. The TRUTONE Guitar amp will be the standard for where all amps should start. Highest quality, STUDIO GRADE COMPONENTS, hand wired with LOVE! We’ve all seen photos of studios that own a wall of guitar tube heads. Certainly having a dozen or more amps to choose from might be ideal, but the total cost can be prohibitive for a studio owner. After all, when top-shelf heads cost several thousand dollars each, you can buy an amp farm or a lot of recording gear. With that in mind I’ve been trying to collect very flexible recording amplifiers. Product Review: Graefe Designs' TruTone™ 50-Watt Guitar Head Takes A Classic Idea and Innovates it. 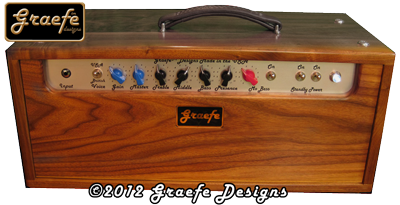 We here at Artisthead were excited to review the beautiful, walnut front, Graefe Designs' TruTone™ head designed by the 45-year studio and gear engineering veteran and musician, Tom Graefe. As soon as I plugged into the Graefe Designs' TruTone™ all tube, 50-watt head and flicked the Standby switch, I noticed how quiet the signal to noise ratio was. As I dialed up the gain knob to 3 and the master to about 2, I was awed at the volume and clarity that this amp delivered, even at modest levels. With the Bass, Middle, and Treble knobs set at noon position, the amp delivered a hearty, full tone that spoke with definition and punctuation. The Presence knob added nice shimmer without getting brittle or harsh. YES, tone controls that actually work! We used several guitars through the TruTone™, a Les Paul, Strat, Telecaster, and a few semi-hollow bodies to hear the tonal differences and response. I noticed right off the bat that this amp was very responsive to the touch and accuracy of my playing. It forced me to play with more control, which in turn made my articulation and sound cleaner. Oddly enough, this quality makes the TruTONE the perfect amp for recording and session work. The clean tones start to peak out at about 4 on the gain knob, giving it a wide variety of sounds familiar in many of the classic and boutique amps, while keeping it's own unique sound. I turned up the gain and the TruTone started to growl with authority. It gave out a punchy, full tone that was excellent for everything from blues to heavy rhythm as the gain was increased. It did so without losing body or sounding flabby. When turned to 10, I could play lead lines that were defined and singing.